One of the P2P lending sites that I think is not used enough by lenders is Lending Works*, which does personal loans to creditworthy borrowers – mostly prime borrowers. Why are lenders ignoring Lending Works? I think Lending Works just doesn't appear, at first site, to tick all boxes for some lenders. The first box is Lending Works' interest rates. These are around 6%-6.5%, which makes them the highest on offer for lending in regular personal loans, which, when combined with the best results in terms of risk, should impress lenders. But these are just not quite attractive enough to some people, who want to go further up the risk and reward scale, perhaps only getting interested above 8%. When you go higher, up to maybe 12%, you also usually suffer more problems and more bad debts. Ultimately, the additional headaches mean you should be expecting to earn something closer to Lending Works' rates anyway, and actually a good portion of you will earn less when the bad-debts dust has settled. The second box that many lenders want to see ticked is that they are doing secured lending. The idea, as you might expect from the info sidebox, is that secured lending should be lower risk. However, this is far from always the case. That is why a lot of secured lending comes with higher interest rates, which is not a lucky break for secured lenders – it actually reflects the reality of the risks involved. That reality is that a lot of types of secured lending come with a high proportion of loans turning into bad debts. Yes, you should generally expect to recover more of those bad debts than you will with personal loans, but the higher number of bad debts can counteract this. So there are kinds of secured lending that is somewhat or even very risky. 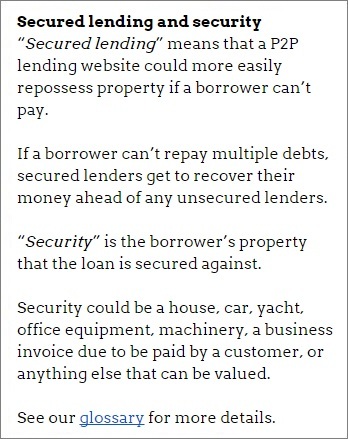 And yet some kinds of unsecured lending isn't. Lending Works' mostly prime loans is a strong example of that. Lenders also have a very substantial reserve fund to back it up during the good times. On top of that, unlike a lot of secured lending, Lending Works makes it extremely easy to spread your money across lots of loans. It's an advantage that is available because personal loans tend to be small and numerous. In a serious recession, when Lending Works' reserve fund could be depleted, lenders will see their money redistributed across all outstanding loans. That's thousands of loans, which removes the possibility of being in the unlucky minority that suffers very poor results compared to everyone else. Lending Works* is best in class for personal loans and offers instant diversification. It seems like a natural choice to me that should interest most lenders. Every P2P lending site needs to be monitored. Again, for Lending Works, I think there are two main boxes to watch. There are a few signs that Lending Works* has weakened its criteria and started to accept a number of riskier borrowers, although to compensate for that it is also charging higher interest rates – averaging over 12% borrower rates instead of under 10%. Plus, your risks are still spread across all borrowers in the event that the reserve fund is overwhelmed. Based on the information we have, Lending Works' story has not changed enough to warrant any concern at this early stage, especially since it was more selective to begin with than it needed to be. But, as usual, it is something to watch in future. To keep an eye on the borrower risk side, aside from reading 4thWay, you need to look to Lending Works' statistics. If the average borrower rate goes up a great deal higher while the Bank of England base rate remains low, that is one sign. Another sign is if bad debts shoot up a great deal faster than at Zopa, its nearest competitor, when there is no recession or economic crisis occurring. So, basically, keep your antennae switched on. The other item to watch is interest rates. Lending Works' rates could fall a percentage point or two and still offer great cover, provided the quality of the borrowers does not deteriorate too much at the same time. However, you don't want to see too much compression, where the lending rates go down a lot further while the borrower quality worsens, as we have seen at Zopa*. Read the Lending Works Review from one of 4thWay's experts. *Commission and impartial research: our service is free to you. We already show dozens of P2P lending companies in our accurate comparison tables and we keep adding more as soon as they provide us with enough details. We receive compensation from Lending Works and Zopa, and other P2P lending companies not mentioned above when you click through from our website and open accounts with them. We vigorously ensure that this doesn't affect our editorial independence. Read How we earn money fairly with your help.